Ubuntu Linux, Day 21: Enough Already With the Updates! Ubuntu Linux, Day 3: Dude, Where's My iTunes? We are heading into the home stretch on the 30 Days With Ubuntu Linux series. If I were to score Ubuntu Linux today, it would get generally high marks, but there is one thing that has really been annoying me--the updates. I get it. I understand that one of the strengths of Linux--or open source software in general--is that everybody and their uncle can update it. I understand that there are benefits to having an entire global community of developers tweaking the software, expanding the features and capabilities, and rapidly deploying updates for security issues. But--for the love of all things holy--I don't want to be bothered with the updates every damn day! 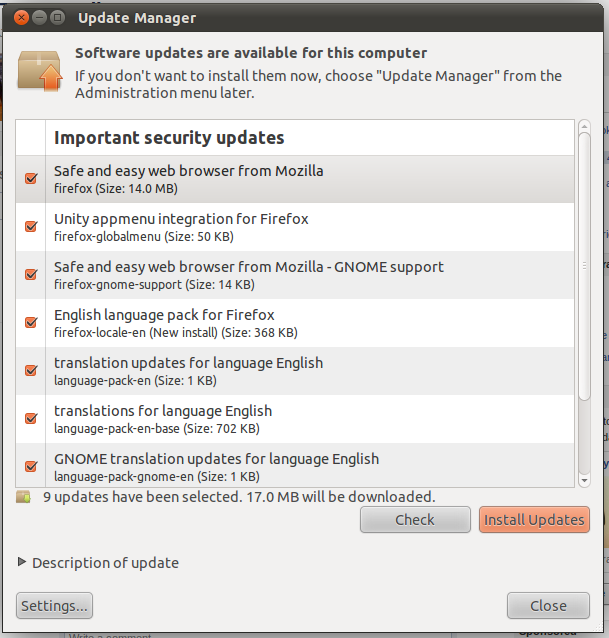 By default, Ubuntu Linux automatically notifies you of new updates each day. Apparently the default is to check for updates daily, and notify me that they exist so I can download and install them. On the up side, I will say that no matter how many updates there are, the process goes rather quickly and smoothly. But, I'd still rather not have to deal with it so much. There is a reason that Microsoft evolved from the random releasing of patches and updates whenever the mood hit to a planned schedule with Patch Tuesday. IT admins have other jobs to do besides playing patch nanny--testing and validating updates to verify they don't break any critical servers or business functions, then deploying the updates and following up to ensure that all applicable systems are patched...only to get blindsided with new critical updates to start the process over again. With Patch Tuesday, you know when to expect the patches, and you can plan testing and deployment efforts accordingly so you can focus on the other things the rest of the month. Change the Ubuntu Update Settings to make the updates work the way you want. For average users of Windows--a.k.a. consumers--I highly recommend simply turning on Automatic Updates, setting it to check every night at like 3am, and changing the setting to let the OS automatically install any necessary updates. That way it all happens while you're sleeping, and you just wake up to a patched and updated system without having to be bothered. Thankfully, I can do the same thing in Ubuntu Linux. Just like Windows, it just takes a little effort to alter the default update settings. At the bottom of the Ubuntu Update Manager window, you just click on the Settings button. I configured it to get important security updates, and recommended updates, and to install security updates without asking for confirmation. Linux is a small fish in the OS pond, so the threat of malware is significantly less. 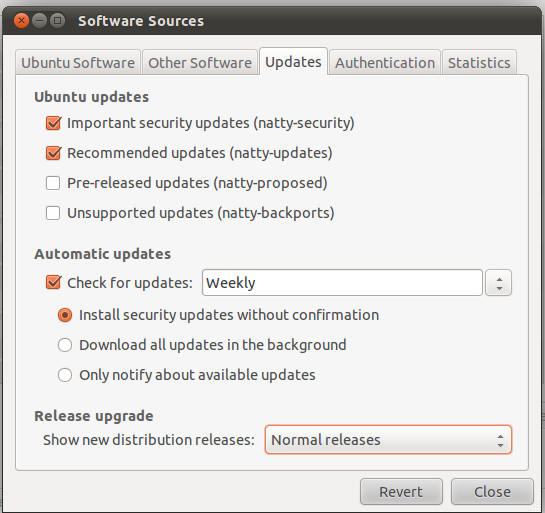 I decided that weekly checks for updates are probably sufficient for Ubuntu. Voila! Now I can use Ubuntu Linux in peace without being asked to download and install new updates every day.